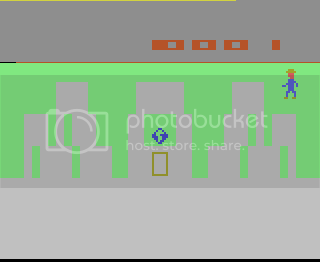 The third Atari run submitted to this site. In this game, you control Superman for less than a second before becoming --AVERAGE CITIZEN CLARK KENT-- who must repair the bridge destroyed by Lex Luthor, capture Luthor and his criminal underlings, enter a phonebooth to turn back into Clark Kent, then return to the Daily Planet in the shortest amount of time. To slow Superman's Kent's progress, blobs of paintKryptonite has been released by Luthor. If hit by paintKryptonite, Superman loses his abilities to capture criminals and fly. To regain them, he must find and passionately kiss Lois Lane. Fortunately, with the power of HAX, our AVERAGE CITIZEN prove that sometimes, human skills are just enough. ;) I make short work of an already normally short game. The glitch I abused involves pausing the game, which after a while, goes into this "Demo" mode where it loops through the whole game (kinda like a preview of it). If you move, normally, it would unpause the game and put you back to where you were. But if you were on a door, it glitches and allows you to enter. I take the subway (yes, that's what the yellow room is) and go to the daily planet to end the game. Note: if the bridge collapse is triggered, you can't win by going to the daily planet. You must do all that crap I listed instead. If such a crap game like "E.T. - The Extra-Terrestrial" got accepted, why not this? This was reviewed by the AVGN after all. Anyway, this TAS is comparable to The Amazing Spider-Man TAS by nitrogenesis since you're not supposed to do this in normal gameplay. But since playing legit knocks people to sleep, I drastically shorten the game! I move two steps, paused the game, wait past 2 screen transitions, and walk left to finish this game. Mothrayas: Replaced submission with a three frame improvement by the author.